Where you locate your spa has a big impact on how often you’ll use it. We encourage you to consider these tips when deciding on just the right spot. 10’ or less. Place your spa a maximum of ten feet away from the access door. Ideally, even less distance is better for inspiring regular use of your spa. Strong and level. The surface your spa rests on must be able to support a great deal of weight. You can find out just how many pounds a spa full of water weighs by comparing models. A flat, even surface is also important for a proper installation. Water where it should be. Water, whether from rain or from splashing, needs a way for it to flow away from your spa. This will ensure a nice, clean, dry place around it. Keep clear. Regular maintenance is important to the health of your spa. 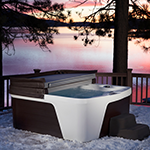 Placing your spa so there’s easy access to the control panel will simplify maintaining your spa. Place your spa out of the path of falling leaves and other debris. Also notice where gutters channel rainwater as well as where wind often blows. Another bit of simple planning that will help keep your spa inviting is to keep the path to your spa clean, clear and well-lit. That will make it easier to get to-and-from your spa, reduce debris from tracking in, and help create a welcoming experience. There are four recommended surfaces you can select from and each has their advantages. A concrete slab made of reinforced concrete that is at least 4-inches thick and able to support at least 120-pounds per square foot provides the most strength and support. As the concrete must be completely dry and fully cured, the slab must be poured well in advance of your hot tub installation. A prefabricated spa pad combines strength with convenience. 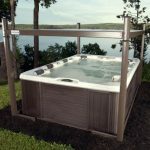 The system comes in interlocking pieces that make it easy to assemble with no significant amount of lead time needed before installing your spa. A gravel base in either crushed rock or gravel can provide a foundation that’s more affordable than other options. Before the materials are brought in, the ground should be well-compacted and a drain installed to handle rainwater and any tub spillage. A deck can be a welcoming place to put your spa, and yes it can be done. We recommend you have a conversation with a structural engineer or a contractor who has experience building such projects. They’ll need to figure out how much everything will weigh—your hot tub, water and several people—and then design a deck to support it. 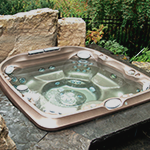 If you purchase another brand of hot tub, you may likely require an electrician to hard-wire a GFCI-protected 220-240 volt 50-amp circuit. Spas with multiple pumps may need a 50-60- amp service. 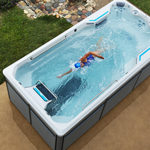 And while larger spas can require even more power, some smaller hot tubs can run off a standard 110V source, reducing the installation requirements. Beyond power there are other safety codes to follow, such as a manual disconnect device installed at least five feet away and that is easy to see and access. It’s best to engage a professional licensed electrician to do the work. Trees, shrubs, and fences offer screening so you can enjoy your backyard retreat in privacy. 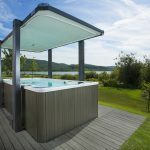 And the more safe and secure you’ll feel in your hot tub, the more soothing your experience will be whenever you ease yourself into the calming and rejuvenating waters of your own private spa. We know how excited you are to have your own spa and that you want to do everything you can to make the installation go effortlessly. That’s why knowledge is so important. Please take the time you need to prepare, and ask us any questions you have about spas and spa installation.